Human and organisational factors (HOF) specialists in regulators help to form and enable compliance with good legislation to protect health and safety. Experience in the UK Health and Safety Executive (HSE) suggests that developing the right HOF capability, with a diverse and independent team of specialists, is critical. A small and credible HOF team with a clear and simple strategy can do a great deal in a relatively short time to improve HOF uptake and activity, internally and externally. This includes developing freely available, practical guidance and tools, developing guidance for safety report criteria, providing effective regulator training and routine HOF inspection and support for enforcement. 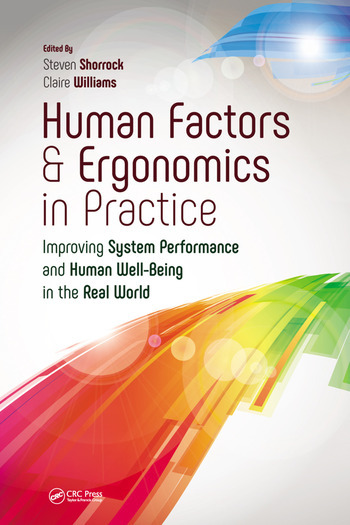 While it helps to understand HOF first by ‘looking in the mirror’ (by investigation), regulators also need to focus on design and human factors integration (HFI) – getting it right first time. There are, however, various barriers to implementation, and unintended consequences. And those working on regulated sites need to be aware of the time required to implement HOF and implications of complexity and the rate of change. First off, from my perspective, it is a fascinating story. I knew very little about how John got into his line of work and what events formed his human factors specialization. It was educational to see how HOF were incorporated in regulatory practices, and the role the author played in shaping that process. I found myself highlighting sentences here and there, formulating a list of “to-do’s” for myself as I work to try to draft a HOF investigation protocol and advance the HOF capabilities of my agency. The author’s identification of key attributes/aspects that led to HSE success in integrating HOF into its work was also invaluable. For example, early HOF support via direct input to assist other HSE inspectors in gathering relevant information/evidence; the importance of inspectors having sufficient experience in/of the industry they are applying their HOF skills to; building HOF skills through investigative activities before using them for auditing purposes; and getting HSE HOF specialist inspectors offshore (and in the field, in general). All in all, I found the chapter very insightful and useful for HOF practioners in general seeking to explore ways to develop and enhance their organization’s HOF expertise, and I personally see the chapter as a roadmap for me to help my agency grow in this arena. One of my key reflections on being a regulator specialising in HOF is that there exists a huge amount of detail on a range of HOF topics, however, there is a lack of practical guidance for industry. Now working in industry, it’s clear that we need to better translate HOF materials so that they can be applied by the non specialist. Many of those responsible for applying HOF in the safety-critical or major hazard industries are not HOF specialists. There is a mismatch, however, between a focus on the production of more and more guidance and research, rather than focussing on applying what already exists. The topic of safety culture is a good example of this – there is now so much research available that even HOF specialists have difficulty in staying current. I’d like to see less “new” materials, and more focus on fit-for-purpose tools and guidance for those working in safety-critical industries, who are often not HOF specialists. I recall that as a HOF regulator, we needed to have skills and experience not just in HOF, but also industry-specific knowledge in order to be able to translate HOF concepts into their language, and to identify opportunitiers where HOF could have an impact. It was also necessary for the HOF specialist to have excellent communication skills, in order to challenge and guide both HSE management as well as industry. My experience is that many managers and leaders in industry just want a page of guidance on a topic – what’s the key issue, the main principles, how to get started, not large, detailed reports and documents – often only read by other specialists. Industry wants to engage more with this topic – I was often asked to provide examples of other companies who were doing this well, and to be honest, it was often difficult to provide such examples. What industry needs are more case studies, more documented applications of HOF in practice. The way to progress is for industry to be able to apply HOF – and then show their peers what worked, how and why. Looking back on my time as a regulator, we had the largest impact when we made clear links between HOF and process safety, HOF interventions cannot be effective in a vacuum. My advice for regulators would be to get in early (before a company progresses an organisational change; or before they investigate an incident, or introduce changes to aspects of their safety management system) – and to work with someone who can act as a HOF “champion” in the company, someone who can help to translate, and identify the links and opportunities. How regulators address human and organisational factor (H&OF) is certainly one major topic for the years to come. Because of historical, intellectual and institutional reasons, UK and France have had different experiences but the rationale remains the same. Similarly, but later than in UK, French authorities have started to incorporate knowledge from fields such as ergonomics and sociology to offer guidance both to the industry and inspectors, along with the development of training modules for inspectors. It is not the place for a detailed comparison although it would be highly beneficial in the future at the European level, as John Wilkinson suggests, and because of the longer experience of UK in this matter. In France, a series of guides have therefore been released in the past few years on, for instance, human barriers in risk analysis, the impact of organizational changes or on H&OF engineering. A few words about this last one. The guide on H&OF engineering attempts to find ways to move one step further in our appreciation of how safety critical organisations introduce in their management the knowledge available in H&FO. How do companies translate human factors engineering in their activities? Do they rely on external consultancy to do so? How often? When? Do they train some people internally instead? How do they introduce Safety Culture or High Reliability Organisations ideas in their daily processes? Do they rely on a network of people internally who are in charge of it through specific methods and tools? Etc. Our studies show that the landscape is made of a very wide diversity of situations in the industry. Companies have had in the past 10 years different experiences of H&OF. It has, as a consequence, recently seemed more and more important in this area to move one step further and express more clearly the diversity of possibilities in terms of knowledge, tools, methods and resources in H&OF so that both industry and regulator share a background in this domain. There might be a long way before this happens in a satisfactory manner, but this is what makes this field an exciting one, including the challenges of keeping up more broadly, as John Wilkinson writes, with global changes. This entry was posted in Part 3: Domain-specific issues and tagged accident investigation, accidents, guidance material, inspection, legislation, regulation. Bookmark the permalink.